URBANA, Ill. – We may not be able to see them, but plant leaves are riddled with tiny pores that open to bring in carbon dioxide, the gas converted into sugars through the process of photosynthesis. The pores, known as stomata, are dynamic, opening and closing in response to internal and external cues. The work is important, in part, because it advances scientists’ understanding of what’s going on in corn leaves. Most previous knowledge of stomatal signaling comes from the lab rat of the plant world, Arabidopsis thaliana, a small flowering plant in the mustard family that differs from corn and other crops in a couple of big ways. A crucial difference is the way both plants handle carbon dioxide. 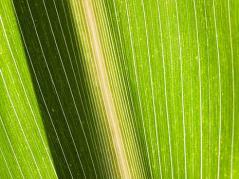 Corn concentrates carbon dioxide inside the leaf, allowing it to keep its stomata closed more of the time. Since water vapor escapes from stomata at the same time carbon dioxide enters the leaf, keeping stomata closed reduces water loss from the plant. “Previous research with Arabidopsis is valuable – it provides a launch pad for our work – but directly studying corn is going to be more applicable to the industry because there are fundamental differences; even the shape and pattern of the stomata are different,” Studer says. Studer and his colleagues found that corn has multiple copies of the gene for an enzyme called carbonic anhydrase. They demonstrated that one copy, ca1, is involved in kicking off photosynthesis in corn, and another, ca2, signals stomata to close. Understanding the roles of these variants and others could one day help breeders improve corn in the future by making specific changes. Because stomata are the gatekeepers for both carbon dioxide uptake and water loss, the tiny structures will be crucially important in responding to a climate with more carbon dioxide and less predictable rainfall. Although corn stomata are currently effective at conserving water, the new study identifies ways they could be improved. The researchers compared the performance of corn plants with and without ca1 or ca2under well-watered and drought conditions. Without the genes regulating stomatal closure and the beginning stages of photosynthesis, the experimental plants did not perform well. But they didn’t do as badly as one might expect. Studer thinks additional versions of the ca gene filled in the gaps. “Even though there isn’t as much carbonic anhydrase in the mutant plants, even a little might be enough because it is the fastest enzyme on the planet,” he says. The article, “Carbonic anhydrase mutants in Zea mays have altered stomatal responses to environmental signals,” is published in Plant Physiology [DOI: 10.1104/pp.18.00176]. Additional authors include Allison Kolbe, Thomas Brutnell, and Asaph Cousins. The research was supported by the National Science Foundation and by the U.S. Department of Energy.